Central Park is roughly divided into thirds. 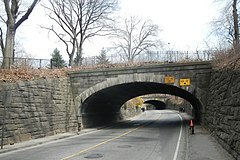 From north to south, they are the "North End", north of the Jacqueline Kennedy Onassis Reservoir; "Mid-Park", between the reservoir to the north and the Lake and Conservatory Water to the south; and "South End", south of the Lake and Conservatory Water. 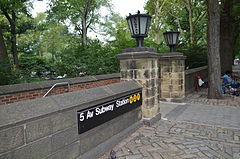 The park contains six visitor centers: Charles A. Dana Discovery Center, North Meadow Recreation Center, Belvedere Castle, Chess & Checkers House, the Dairy, and Columbus Circle. The park is maintained by the Central Park Conservancy, a private, not-for-profit organization that manages the park under a contract with NYC Parks, in which the president of the Conservancy is ex officio Administrator of Central Park. Today, the conservancy employs 80% of maintenance and operations staff in the park. It effectively oversees the work of both the private and public employees under the authority of the Central Park administrator (publicly appointed), who reports to the parks commissioner, conservancy's president. As of 2007[update], the conservancy had invested approximately $450 million in the restoration and management of the park; the organization presently contributes approximately 85% of Central Park's annual operating budget of over $37 million. The park's patronage increasingly came to include the middle class. Strict regulations, such as those against public gatherings, were gradually eased. Because of the heightened visitor count, neglect from the Tammany administration, and budget cuts demanded by taxpayers, the maintenance expense for Central Park had reached a nadir by 1879. Olmsted blamed politicians, real estate owners. and park workers for Central Park's declined. However, Central Park was generally expensive to maintain, so the reduction of the budget was a major factor in the park's subsequent decline. By the 1890s, the park faced several new challenges, as cars were becoming commonplace, and people were beginning to see the park as a recreational attraction. The late 19th century saw the appointment of landscape architect Samuel Parsons to the position of parks superintendent. Parsons, a onetime apprentice of Calvert Vaux, helped restore the nurseries of Central Park in 1886. Parsons closely followed Olmsted's original vision for the park, restoring Central Park's trees while blocking the placement of several large statues in the park. Under Parsons's leadership, two circles (now Duke Ellington and Frederick Douglass Circles) were constructed at the northern corners of the park. He was removed in May 1911 following a lengthy dispute over whether an expense to resoil the park was unnecessary. A succession of Tammany-affiliated Democratic mayors were indifferent toward Central Park, though mayor Jimmy Walker frequented the Casino as a nighttime party destination. Several park advocacy groups were formed in the early 20th century. The citywide Parks and Playground Association, as well as a consortium of multiple Central Park civic groups operating under the Parks Conservation Association, were formed in the 1900s and 1910s to preserve the park's character. The associations advocated against such changes as the construction of a library, a sports stadium, a cultural center, and an underground parking lot in Central Park. A third group. the Central Park Association, was created in 1926. The Central Park Association and the Parks and Playgrounds Association were merged into the Park Association of New York City two years later. Since then, at least seven different organizations have been formed with the aim of improving Central Park. In 1926, at the opening of the playground near the southern end of Central Park, philanthropist August Heckscher announced that he would start a program to raise $3 million for Central Park improvements. The following year, mayor Walker commissioned Herman W. Merkel, a landscape designer to create a plan to improve Central Park. Merkel's plans would combat vandalism and plant destruction, as well as rehabilitate paths and add eight new playgrounds, at a cost of $1 million. :6–7 (PDF pp. 5–6) One of the suggested modifications, underground irrigation pipes, was installed soon after Merkel's report was submitted. The other improvements outlined in the report, such as fences to mitigate plant destruction, were postponed due to the Great Depression. Improvements to the northern end of the park began in 1989, and the Conservancy announced a $51 million capital campaign in 1993. This resulted in the restoration of bridle trails, the Mall,:22 the Harlem Meer, and the North Woods, as well as the demolition of the Mall's bandshell and the construction of the Dana Discovery Center on the Harlem Meer. This was followed by the Conservancy's overhaul of the 55 acres (22 hectares) near the Great Lawn and Turtle Pond, which was completed in 1997. After citywide budget cuts in the early 1990s resulted in attrition of the park's routine maintenance staff, the Conservancy hired additional volunteers to replace them. In 1996, the core maintenance and operations staff were reorganized so the zone-based system of management was implemented throughout the park. The Conservancy assumed much of the park's operations in early 1998. In 2012, hedge fund manager John A. Paulson announced a $100 million gift to the Central Park Conservancy, the largest ever monetary donation to New York City's park system. Minor renovation projects continued through the park in the late 2010s. The Belvedere Castle closed in 2018 for an extensive renovation. The same year, it was announced that Lasker Rink would be closed between 2020 and 2023 for a $150 million renovation. The Delacorte Theater would also be closed from 2020 to 2022 for a $110 million rebuild. Twenty-nine sculptures have been erected within Central Park's boundaries over the years. These sculptures were not part of the Greensward Plan, but nevertheless included to placate wealthy donors when appreciation of art increased in the late 19th century. Many of these sculptures are busts of authors and poets, located in an area now known as Literary Walk, adjacent to the Central Park Mall. Another cluster of sculptures, located around the Zoo and Conservancy Water, are statues of characters from children's stories. A third sculpture grouping primarily depicts "subjects in nature" such as animals and hunters. In the late 19th century, West and East Drives was a popular place for carriage rides, though only 5 percent of the city was able to afford the carriage. One of the main attractions in the park's early years was the introduction of the "Carriage Parade", a daily display of horse-drawn carriages that traversed the park. The tradition of carriage horses in New York City was revived in 1935. The carriages have appeared in many films, and the first female horse and carriage driver, Maggie Cogan, appeared in a Universal newsreel in 1967. As such, they have become a symbolic institution of the city. For instance, after the September 11 attacks, in a much-publicized event, mayor Rudy Giuliani went to the stables himself to ask the drivers to go back to work to help return a sense of normality. The drives were formerly two-way traffic, but in November 1929, the scenic drives were converted to unidirectional traffic. The improvements were intended to increase pedestrian safety. Prior to the changes, there were large numbers of collisions between pedestrians and vehicles. In the first ten months of 1929, eight people were killed and 249 were injured in 338 separate collisions. Further improvements were made in 1932 when forty-two traffic lights were installed along the scenic drives, and the speed limit was lowered to 25 miles per hour (40 km/h). The signals were coordinated so that drivers could go through all of the green lights if they maintained a steady speed of 25 mph. The drives were experimentally closed to automotive traffic on weekends starting in 1967, for exclusive use by pedestrians and bicyclists. In subsequent years, the scenic drives were closed to automotive traffic for most of the day during the summer. By 1979, the drives were only open during rush hours and late evenings during the summer. During the 2000s and 2010s, new supertall skyscrapers were constructed along the southern end of Central Park, in a corridor commonly known as Billionaires' Row. According to a Municipal Art Society report, such buildings cast long shadows over the southern end of the park. A 2016 analysis from the The New York Times found that some of the tallest and skinniest skyscrapers, such as One57, Central Park Tower, and 220 Central Park South, would cast shadows that can be as much as 1 mile (1.6 km) long during the winter, covering as much as a third of the park's length. In 2018, the New York City Council proposed legislation that would restrict the construction of skyscrapers near city parks. The value of the surrounding land started rising significantly in the mid-1860s during the park's construction. The completion of Central Park immediately increased the surrounding area's real estate prices, in some cases by up to 700 percent between 1858 and 1870. It also resulted in the creation of the current system of zoning in Upper Manhattan. Upscale districts grew on both sides of Central Park following its completion. On the Upper East Side, a portion of Fifth Avenue abutting lower Central Park became known as "Millionaires' Row" by the 1890s, due to the concentration of wealthy families in the area. The Upper West Side took longer to develop, but row houses and luxury apartment buildings came to predominate the neighborhood, and some were later included in the Central Park West Historic District. From the 1870s to the park's restoration in the 1990s, the park did not have a significant positive effect on real estate values. However, following Central Park's restoration, some of the city's most expensive properties have been sold or rented near the park. The value of the land in Central Park was estimated to be about $528.8 billion in December 2005, though this was based on the park's impact on the average value of nearby land. ^ "Press Releases : NYC Parks". New York City Department of Parks & Recreation. June 26, 1939. Retrieved April 19, 2019. ^ a b "Loeb Boathouse" (PDF). 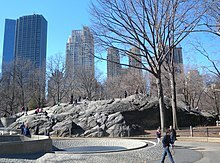 The Official Website of Central Park NYC. Central Park Conservancy. Retrieved April 16, 2019. ^ Wolf, Stephen (May 25, 2012). "Recalling Central Park's Casino and the Roaring Twenties". The New York Times. ISSN 0362-4331. Retrieved April 14, 2019. ^ "TO RAISE $3,000,000 FOR CENTRAL PARK; August Heckscher's Proposal Is Approved by Mayor and Park Association. HE PROMISES TO GIVE PART Half From Public Subscription and Half From City--30,000 at Playground Opening. TO RAISE $3,000,000 FOR CENTRAL PARK". The New York Times. June 22, 1926. ISSN 0362-4331. Retrieved April 11, 2019. ^ Lisa W. Foderaro (October 23, 2012). "A $100 Million Thank-You for a Lifetime's Central Park Memories". The New York Times. Retrieved October 23, 2012.